Dennis Scott of the Orlando Magic dribbles the ball against the Boston Celtics circa 1994 at the Boston Garden in Boston, Massachusetts. 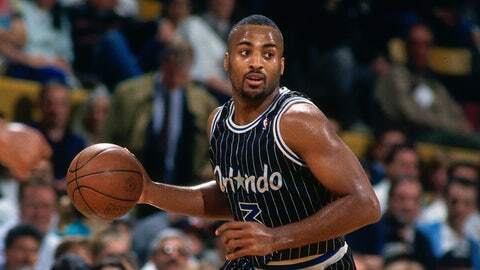 ORLANDO, Fla. — Dennis Scott can look back at his seven seasons as a member of the Orlando Magic with a sense of pride, a sense of accomplishment — and, in one case, a sense of relief. Had the social media phenomenon taken off during the four years when he was teammates with Shaquille O’Neal, Scott’s life beyond the court could have turned out a whole lot differently. "We always laugh and say, ‘What if Twitter and Facebook and all this stuff was out in the ’90s?’ And Shaq is like, ‘Oh, no, we don’t.’ We’re so glad it wasn’t. We might be in trouble right now," said Scott, who will be honored Friday night for his role in the franchise’s 25-year history. Now a studio analyst, primarily for NBA TV, Scott remains the Magic’s all-time leader in 3-point field goals made with 981. Jameer Nelson would need to average 122 3-pointers over each of the next two seasons to overtake him, and the current Magic point guard — who will turn 32 in February — has never made that many in any single year. Scott was drafted with the fourth overall pick in 1990 after the Magic had just completed their first NBA season. This was back when the team’s practices were held in a small, city-run recreation center across the parking lot from the Orlando Arena. Memories of things like that came rushing to mind when Scott was contacted by the Magic’s public relations staff to appear at the game against the Cleveland Cavaliers at Amway Center. "Like I’ve always said, Orlando’s always been a special place," he said. "It gave me the first opportunity to live my dream of playing in the NBA. And then I started thinking of all the relationships, all the people, the fans, the kids, the schools we spoke at, playing in that little rec gym at the beginning and now there’s that multi-multi-billion dollar arena they’re playing in now with a practice court. Just knowing that I was part of the beginning, when it all started, and here we are 25 years later. And look at how the franchise is thriving, still doing well. It’s just good to be a part of something very positive." Scott came to the Magic two years ahead of O’Neal and three years ahead of Penny Hardaway. The three of them were reunited this past March when Scott got to work with O’Neal on TNT because Charles Barkley and Kenny Smith were busy doing the NCAA Tournament for CBS. Unbeknownst to Scott and O’Neal, someone at TNT had talked Hardaway into coming to its Atlanta studios for the purpose of surprising his two former teammates. The stories, and the laughs, didn’t take long to start flowing. "It was fun," Scott said. "And we began reminiscing about how we all came together, the drafts, the injuries … It’s just amazing now, at 45 years old, how fast it happened." By 1997, two years after reaching the NBA Finals, Scott was traded to the Dallas Mavericks and O’Neal had signed with the Los Angeles Lakers while knee problems were beginning to take a toll on Hardaway. Scott became something of a basketball vagabond, going from Dallas to Phoenix, New York, Minnesota and Vancouver — where the Grizzlies were based at the time — during a three-year span. "Working (at NBA TV) with Rick Fox, he was with the Boston Celtics for his first six years and then he goes to L.A. for seven years," he said. "Different guys go somewhere for three or four years and win with them and then go somewhere else and win again. For whatever reason, the basketball gods said, ‘Orlando is where your foundation is.’ "
He briefly teamed up with O’Neal in the fall of 2001 after the Lakers were coming off their second of three consecutive championship seasons. That final fling lasted all of three weeks. "It came down between me and Mitch Richmond," Scott said. "Mitch Kupchak and Phil Jackson were very gracious and very honest and up front. They said, ‘Hey, (Jerry) Buss doesn’t want to keep a 15th player. We’d love to keep you, but we’ve decided to go with Mitch Richmond.’ And that was pretty much the last time I’ve laced ’em up." Seventeen years after they were last together with the Magic, Scott remains in close contact with O’Neal, who has not yet been asked to come to Orlando for this season’s silver anniversary festivities. "Now that we work together, I pretty much see him every other day," said Scott, who will join Tracy McGrady, Nick Anderson and Pat Williams on the Magic’s list of honorees. "When he was still playing, before he retired and signed on with Turner (Sports), I was still talking with him maybe once or twice a month." He got to watch the current edition of the Magic when NBA TV showed Monday night’s 94-85 loss at Memphis. Scott is complimentary of the young talent which general manager Rob Hennigan has assembled and singled out Nelson for being a veteran influence. "Jameer’s done an excellent job with his leadership," he said. "Knowing that his name was bounced around — is he getting traded, is he not getting traded? — his effort this year has been very, very professional. It’s a great sign. It’s good to see some guys persevere and go out there and do the right thing."